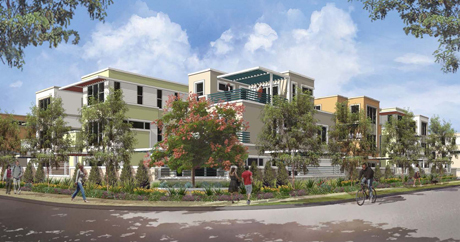 Presidio Residential Capital is developing a 51-unit gated community in the city of Baldwin Park, on the former the site of a church and school grounds. Situated on 3.6 acres at the corner of Baldwin Park Blvd and Merced Ave, the project is expected to cost Presidio about $18.7 mil. South Coast Builders, a division of South Coast Communities, will construct the detached two- and three-story, three- and four-bedroom villas with a variety of plans, elevations and color schemes at the infill site. The project will include a gracious entry plaza on Merced Ave, a prominent water feature and a community park. Reciprocal use easements between homes will create usable yards, and contemporary architectural features such as flat roofs and lighter colors will minimize the density impact. Construction is expected to begin in December 2014, with a grand opening in April 2015. Three home plans, each with two to three variations, will be available. Residents will choose from a three-bedroom, two-and-a-half bath two-story villa; a three-bedroom, three-and-a-half-bath villa with a light-filled second-floor living space; and a four-bedroom, three-and-a-half-bath villa with upper-floor balconies and a third-floor casita with a generous terrace.